First, some ideas of what designs you would like or that may be appealing to you would be helpful. Very often a client has a particular image in mind, or may have seen a painting or photograph of an interesting subject that they like. This reference material will give us an idea of what you would like to have rendered in glass. The reference material is not copied or recreated, but is used only as a guide. From this reference source, an original design called a rendering is created. The rendering is a watercolor painting of the window or lamp which the client approves before any other work is started. At this point, a purchase agreement is signed and a small deposit for the rendering is taken. Upon approval of the rendering, the design phase is complete and another deposit (usually 60% of the total cost of the piece) is taken. 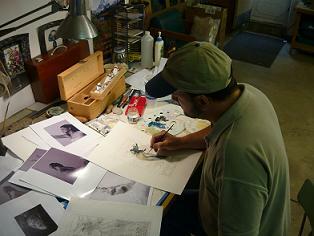 A full size image of the rendering called a Cartoon is then created. From the Cartoon, patterns are made for each piece of glass, and from those patterns the glass is cut and shaped. In the case of custom lighting, a lamp form must also be created for the lamp to be built on. Finally, the individual glass pieces are leaded together. Most often, we mount our windows in either wood or metal frames, which ever the client requests. Each completed original Stelz Studios design that is created exclusively for a client is copyrighted and will not be reproduced again. This insures that the customer receives a one of a kind work of art and not a reproduction. Upon completion of the work, the piece is photographed for our records and then crated and shipped to the client. Final payment is made upon receipt of the piece. Installation of windows are the responsibility of the client. 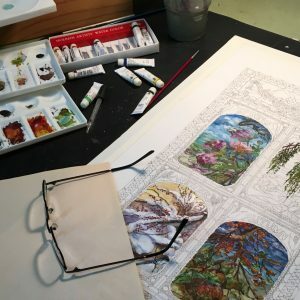 Pebble window | 52" x 20"
Creating a Stelz Studios leaded glass window or lamp is labor intensive and very time consuming, often taking months to complete a commission. Therefore, patience is necessary when scheduling a commission. Steven Stelz and only a few assistants are involved in the creation of these fine quality pieces. These pieces are not mass produced in a factory, they are hand crafted using extreme care throughout all phases of the art glass creation. The final completed piece must be right, otherwise, reworked until it is. With this in mind, it may take several months to begin work on a new project, but… the wait always pays off! Whatever the work, a creation by Stelz Studios is a timeless work of decorative art, to be enjoyed today and by future generations.